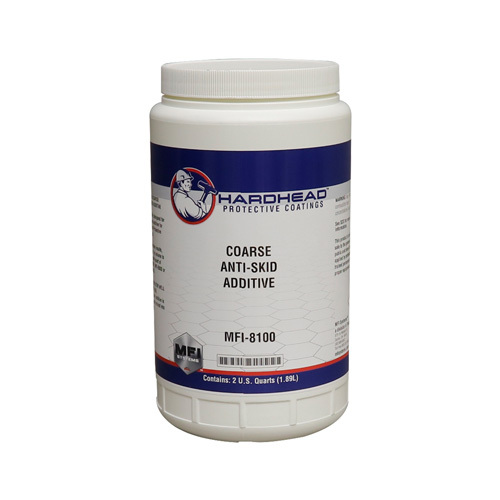 Hardhead Protective Coatings Anti-Skid Additive is a composite media specially formulated for use in coatings to provide an anti-skid surface. It leaves a textured surface that is highly abrasion resistant with excellent durability. It is available in Coarse (MFI-8100) and Medium (MFI-8200). Spray: Using a schutz gun apply a uniform wet coat of texture coating using a sweeping motion. Allow first coat to flash about 2-5 minutes before applying the second (2nd) coat. Second coat should be applied at a higher pressure (80 psi) and a distance further from the panel using a fast sweeping motion. NOTE: Varying the spraying distance and air pressure will vary the texture. Spraying a test panel is recommended. Industrial Texture Coating should only be applied when the temperature is between 60 – 85°F and humidity is less than 70%. DO NOT APPLY IN DIRECT SUNLIGHT. Roll-on: MFI-8000 Series can be applied with a foam roller. A minimum of two applications are required to achieve minimum coverage.